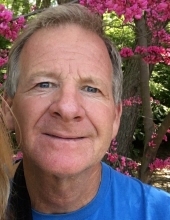 Russell F. Hobson, 60, passed away peacefully at home on January 24th, 2019 in Levittown, PA. Devoted husband of 10 years to his wife Sandra. Russ had a gentle spirit and was friendly to all. Son of the late Arthur “Corky” and Dorothea “Dot” Hobson, brother of the late Glenn Hobson. Russ is survived by his wife, Sandy, a brother and sister in-law, Art & Debbie Hobson, step-children Vinny, Jeremy, Dan, Jeanne, and Eddie, eight grandchildren, and many nieces and nephews. Born in Trenton, NJ on May 22, 1958, and raised in Ewing, Russ graduated from Notre Dame High School and Rider University. He enjoyed traveling around the country to see state or national parks and take in nature. Russ was well known on Long Beach Island, especially the Peahala Park neighborhood, where he lived for over 25 years. Russ loved taking friends and family out on his sailboat, The Rapture. He adored his dog, Abby, and cat, Joshua. His other hobbies included fishing, backpacking, hiking, bird-watching, biking, gardening, watching sports, especially the New England Patriots, and picking flowers for his wife. He will be greatly missed and celebrated by everyone who knew him. Friends may call Saturday, February 2, 2019 from 9-11am at the Wilson-Apple Funeral Home, 2560 Pennington Road, Pennington, NJ 08534. A memorial service will take place Saturday at 11am at the funeral home. In lieu of flowers, donations can be made in memory of Russ Hobson to Joan Dancy & PALS (People with ALS) Foundation at www.joandancyandpals.org. To send flowers or a remembrance gift to the family of Russell F. Hobson, please visit our Tribute Store. "Email Address" would like to share the life celebration of Russell F. Hobson. Click on the "link" to go to share a favorite memory or leave a condolence message for the family.